The small marine plankton diatom Thalassiosira pseudonana Hasle and Heimdal (Guillard's clone 3H) was grown in chemostats with silicate as the limiting nutrient. The calculated maximum growth rates were comparable to those previously reported for this species. The silica content of the diatom shells varied with the growth rate. As the growth rate approached zero, there were still measurable quantities of residual reactive silicate in the medium. In one of the two chemostats used, silicate assimilation by the cells was inefficient due to some unknown internal or external factor. In the other chemostat, statistically calculated half-saturation constants of growth were in the range of 0.5 to 0.8 μg—at Si/l, depending on which kind of correction was made for residual silicate. Half-saturation constants of steady-state mean silicate uptake per cell and hour, calculated in a similar fashion, were in the range of 1.4 to 2.6 μg—at Si/l. These results indicate that the silicate concentrations causing a reduced silicate uptake by this species in nature do not necessarily result in a correspondingly reduced growth rate. 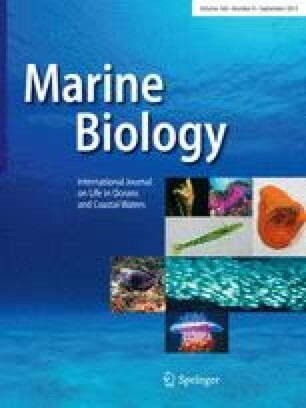 Growth in coastal waters is likely to become seriously limited by a shortage of silicate only when most of the silicate originally present has been removed in the course of a diatom bloom.